Finding yourself on the receiving end of a stingray barb will probably necessitate a trip to the emergency room. But some easy first-aid tips can save you a lot of pain on the way. A misplaced sense of machismo can sometimes cause a guy to make exactly the wrong choice, and as soon as Bruce pulled the anchor and we turned toward Port Royal Sound, I knew I had done just that. The pain that had started in my right foot had now spread to the inside of my knee and then to my thigh. It was, almost certainly, heading toward my heart, which would cause my imminent demise (I imagined). After all, everyone remembers what happened to Steve Irwin. But in fact, while often very painful, encounters with a stingray are rarely fatal. Just a few minutes earlier, during an otherwise pleasant afternoon of fishing off Hilton Head Island, I had made a real "bonehead" move. After a short battle with what I hoped was a redfish, I swung a small stingray onto the deck of the boat. The landing net was sitting uselessly in the corner of my garage at home, so I had to deal with the angry ray as it flopped around the deck of the boat (poor planning being the mother of bad luck). I tried to immobilize it with my foot, which is a maneuver I've performed at least a dozen times in the past without incident. Thinking back on it, though, I've never tried it with the stingray flopping around on its back or while wearing sandals. With uncanny accuracy, the stingray planted its stinger between the straps of my footwear and right into the side of my right foot! The southern stingray is common in South Carolina estuaries (where rivers meet the sea). This bottom-dwelling fish is related to sharks, skates and other rays, who, unlike bony fish, have skeletons made entirely of cartilage (relatively soft, flexible tissue). 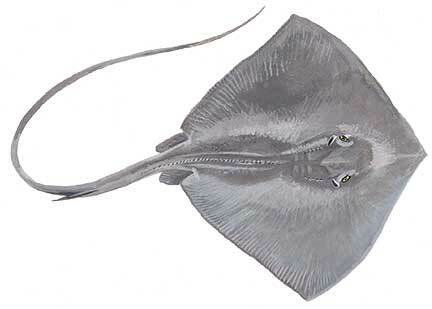 Like all stingrays, the southern stingray has a venomous, stinging spine attached to the base of its tail. The southern stingray also has a flattened body, which it often covers with sediment to blend in with its surroundings. This provides protection from predators and enables it to catch prey more easily. The southern stingray feeds on worms, shrimp, crabs, small fish and bivalves, such as oysters and clams. Source: http://score.dnr.sc.gov/species/stingray.htm. The language that followed was nearly as colorful as the mixture of my blood and the stingray's on the white boat deck. Bruce cut the line and somehow managed to get the stingray back into the water. "Well, what do you want to do now," he asked? At this point my foot hurt, but not unbearably. I replied that I wanted to keep fishing (see misplaced machismo above). We pulled the anchor and headed north, the opposite direction from Skull Creek Marina and the emergency room. Bad move. 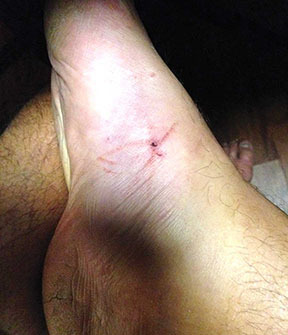 As I steered the boat through Fisherman's Cut, I googled "what to do when stung by a stingray" on my smartphone. The pain seemed exponentially greater when the most common search result was "seek immediate medical attention." "Maybe we better head back ... and maybe you could drive me to Hilton Head Hospital ... just to be safe," I said to Bruce. It was only a ten-minute ride back to the marina, but by the time we got the boat secured at the dock, paid for our gas and carted our gear to the car, I was glad the hospital was close by. My wife, Janet, met us at the hospital looking, at first concerned, and then just a little ticked off when she realized that A) I was not dying, and B) my stupidity was going to cost us the rest of a beautiful Sunday afternoon and most likely several hundred dollars. We spent the next half hour becoming a part of the hospital's database while my leg began to feel like it was being consumed by a raging brush fire. The nurse shook her head. "You need to learn the ‘shuffle,' " she said, leading me back to an exam room. She was referring to the recommended method of shuffling while walking around in the ocean so a stingray will be bumped and scared off before being stepped on. When I explained to her how I had been stung, I immediately got the feeling I had failed a crucial IQ test. A few minutes later she returned carrying a green five-gallon bucket with "STINGRAY" stenciled on it in black letters. "What's in there," I asked nervously? "Scalding hot water; stick your foot in it," she ordered. By now I was thinking the objective was to replace stingray pain with second-degree burn pain, but I was willing to try anything. A doctor examined the wound a few minutes later. He explained that the almost instantaneous relief I experienced when I "poached" my foot in the hot water was the effect of the toxins from the stingray's stinger being neutralized by hot water. 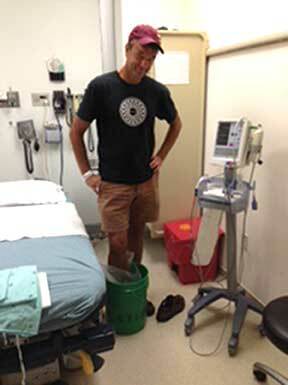 After a couple more buckets, the pain subsided enough to put my sandal on and I limped back to the car. The doctor had prescribed an antibiotic as insurance against infection and warned that about 30 percent of the time, a follow-up X-ray might be required to determine if part of the stinger remained in the wound. According to Dr. Rob Clodfelter, an emergency physician at Hilton Head Hospital, stingray "stings" are a fairly common occurrence at Hilton Head beaches. Most years the hospital and area emergency centers start to see stingray injuries in late May, when the waters warm and bring stingrays into closer proximity with swimmers, says Clodfelter. The stingray's stinger, which is located close to the base of the tail, is covered with a marine bacterium. This "goop" is secreted by two glands near the bottom of the stinger. The poison is not injected, as is commonly thought, but rather contaminates the wound through contact. Because the stinger has a barbed edge, a stingray sting is particularly painful, as the stinger tends to tear the tissue as it exits the wound. Dr. Clodfelter confirms that applying heat to the wound will help break down the effects of the venom as well as reduce the pain. A bucket of hot water at approximately 110 degrees is best, but any source of heat applied directly to the wound can provide some relief, as it begins to break down the protein-based toxin. Often the beach patrol carries heat packs for this initial treatment. Clodfelter advises that a person who has been stung should still visit a medical treatment facility because of the risk of infection and the possible need to extract the stinger. He also stresses that it is important to get a tetanus shot because tetanus lives in the water. When we got back to the house I spent a couple more hours with my foot in hot water and my hand near a cold beer. The pain was soon almost gone. That same afternoon, the incident began its inevitable transition, like all good fish stories, from truth to legend. In time, the stingray will double in size, the nurse will take on the name Ratched and possess forearms the size of tree trunks, and the treatment will have included a defibrillator. In reality, the pain was mostly over in a day. It did take about three weeks for the swelling and bruising to disappear, but fortunately there was no latent stinger to deal with. If you fish the inshore waters around Hilton Head, particularly with live bait, stingrays and sharks are a common nuisance. My new rule is that neither will ever see the interior of a boat I am on. It's far cheaper, quicker and less painful to cut the line! John Turley blogs about Lowcountry adventures at www.janetturleyhiltonhead.com.